Looking for the self-titled Eclectic Blah album? Visit the album page, or enjoy the media player below. Music which is danceable, which is musically interesting, which is totally improvised and doesn't take a lot of rehearsals, which can be played in any lineup imaginable, and which is fun for dancers, for interested audience members and for musicians alike. What might seem like a complete utopia world to anyone who ever tried anything in this direction has become reality in the form of a project called "Eclectic Blah". 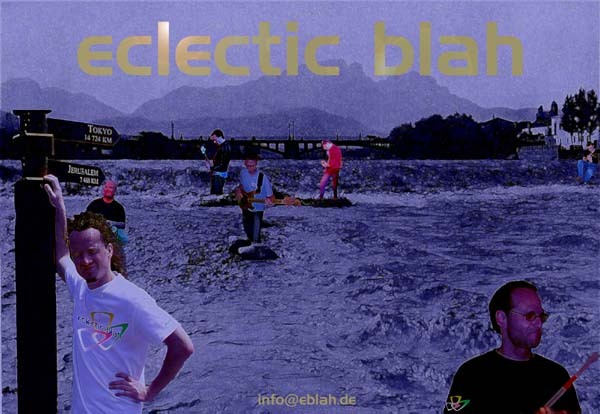 The concept of Eclectic Blah was not based on a fixed set of band members. However, during Eclectic Blah's existence, the majority of the musicians were drawn from a pool of people who played and performed more or less regularily with the group. The project was started by Straschill in August 2001 and continued to be active until March 2005. In the time in between, a total of 12 concerts have been performed to the public, including around 13 different performers. In between those public performances, a lot of sessions took place. Most of the performances were recorded. The recorded output of Eclectic Blah amounts to about 40 recordings of sessions and public concerts of varying length. The majority of live recordings is available in 16-track digital multitrack. So if you ask yourself "will there be an Eclectic Blah album release? ", the answer is something like "I've had that in mind for a long time". And you readers obviously did as well, as this poll result shows.